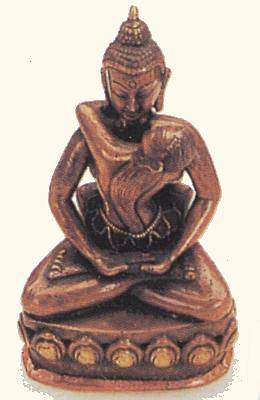 The yab-yum bronze icons of Tantric Buddhism often strike the layman as hedonistic celebrations of eroticism. 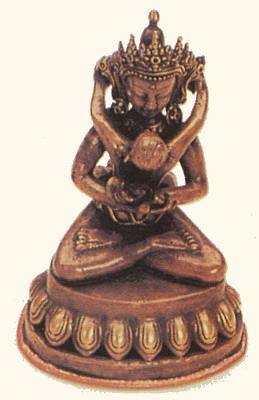 Showing Buddhist deities and their consorts in copulation, yab-yum icons in fact are meditational devices a sadhaka (the Tantric adept worshipper) uses, among other tools, to achieve the religious experience of liberation from the misery of being chained to the false realities perceived by the human senses. 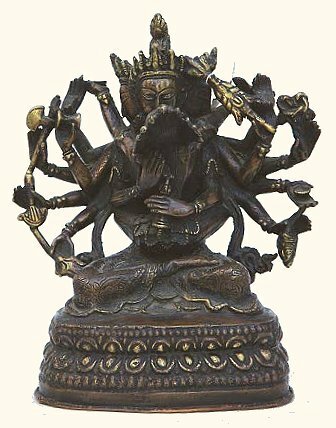 The sadhaka's meditations and scholarship inform him, through conventional logic, that the nirvana he seeks is non-existence, the great bliss of The Void. Sexual sensations are therefore among the miserable, false realities that he knows man must learn to recognize for what it is. His use of sexual imagery to achieve his goal of liberation thus becomes all the more perplexing to us laymen. To him, however, sexual imagery is simply an esoteric language that can only be understood by being an adept properly directed by a more experienced Tantric.